This entry is part of my plan for NaBloPoMo. My first night in Key West I rang mum. I’d had a bad dream the night before that dad was really sick and I knew something had happened, so I really spun out when mum said she had bad news. Auntie B had died. Apparently she was found dead in a chair. Mum didn’t say what from. She was only about 63. ….The beaches were really horrible in Key West. Fort Zachary was full of rocks and coral where sand should have been. It was painful just trying to go for a swim because of having to step over the rocks, or pebbles I should say. 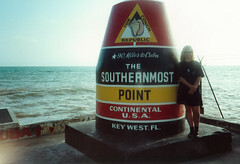 The above diary entry was written on 7 December 1991, but after I’d left Key West when I was in Orlando. Auntie B was only 60 when she died of a heart attack, and she’d only recently retired. I didn’t have a lot to do with her which I now regret because I know I could have learnt a lot more from her and had some great conversations. She was a staunch feminist and very intelligent. I know that now I’m older I could appreciate this a lot more than I would have then. She would be 75 now if she were still alive. She died before I started at university and I’m sure she would have been proud of me doing this. I wrote about the beaches because I had never encountered a rocky beach before. We’re very lucky here with our beaches being pretty clean and mostly sandy. Sometimes we have to contend with seaweed but that rarely overtakes the whole beach – there’s usually some sand to walk or lie on. I also remember lying on a beach in front of a hotel and getting told to move because it belonged to the hotel. What? Beaches are public I thought.